SHOW US YOUR JUNK, DIRTBAG! 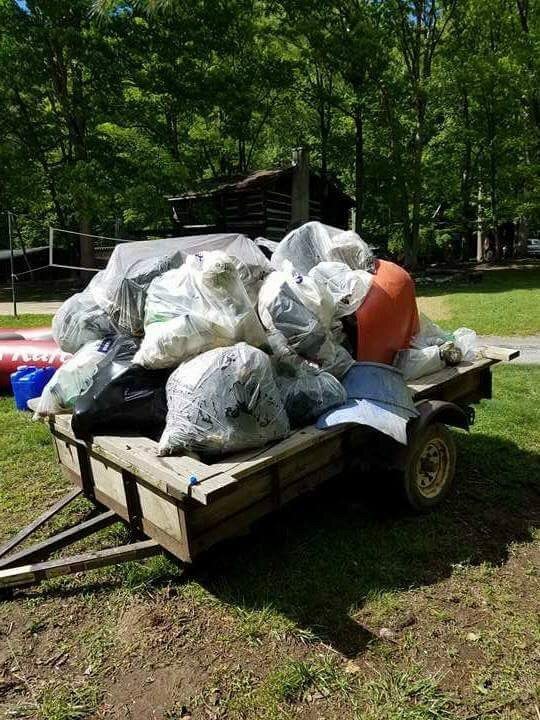 ~ Nolichucky Gorge Cleanup. by Michael Potter | DBP MAGAZINE ONLINE The World's Best Free Whitewater Publication. Back in April I was challenged by our Editor-in-Chief Chicago Mike Toughill to do a cleanup on any river of my choice. Naturally I chose the Nolichucky Gorge. Not only is it my home river, it happens to be my favorite river. Eight miles of beautiful gorge wilderness. Some of the prettiest scenery that East Tennessee has to offer. 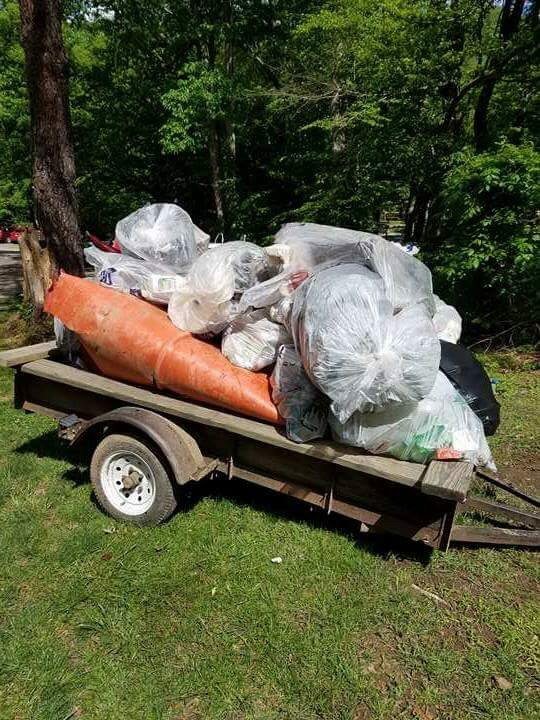 I had never organized a cleanup of a river before so I knew that I was going to need some help. 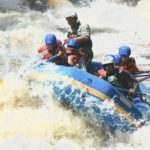 I contacted Matt Moses of USA Raft and Mountain River Guides to rent a raft. Matt would not rent me a raft; he volunteered rafts, guides, and oar rigs. He also gave raft spots to those not capable of paddling the gorge in their own vessels; this a class lll/lV section of whitewater. The day came for the cleanup and so did the issues of Tennessee weather. If you don’t like the weather here just hang around for five minutes, it will change. It did change, to snow! Matt and I decided that it would not be good to continue with the cleanup. We rescheduled for May 13th. May 13th came and so did the weather. Nolichucky levels were at a pristine the whole week before the cleanup. It started raining on May 12th! Levels escalated from 1800 cfs to 5000 cfs! Matt’s associate Chris Lennon and I discussed the issue and decided to keep the Lower Noli in mind as an alternative. I was still concerned about the levels when I arrived on the 13th and it was still raining! Chris took me into the office and sat me down for a solid decision. I was all for changing to the Lower section. Chris informed me that the guides wanted the GORGE! 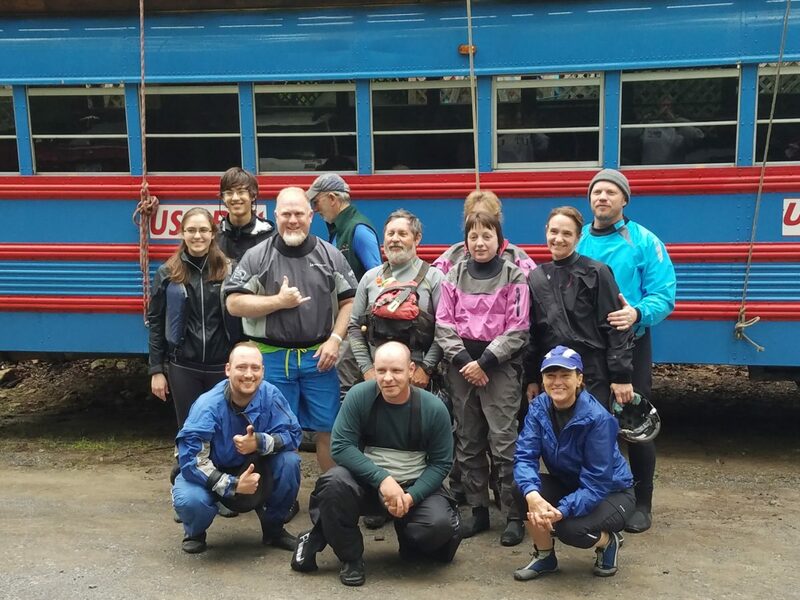 After general consensus I found out that this whole nutty crew of volunteers wanted the high water gorge. I asked Chris if he had two more raft spots for Jerry Griffin and I. Jerry’s been my advisor for the cleanup from the start. Chris put us all in spots and we were off to the river. We had three kayakers: Ben Carr, Elliot Lavery, and Steven Adams. The rest were in rafts. 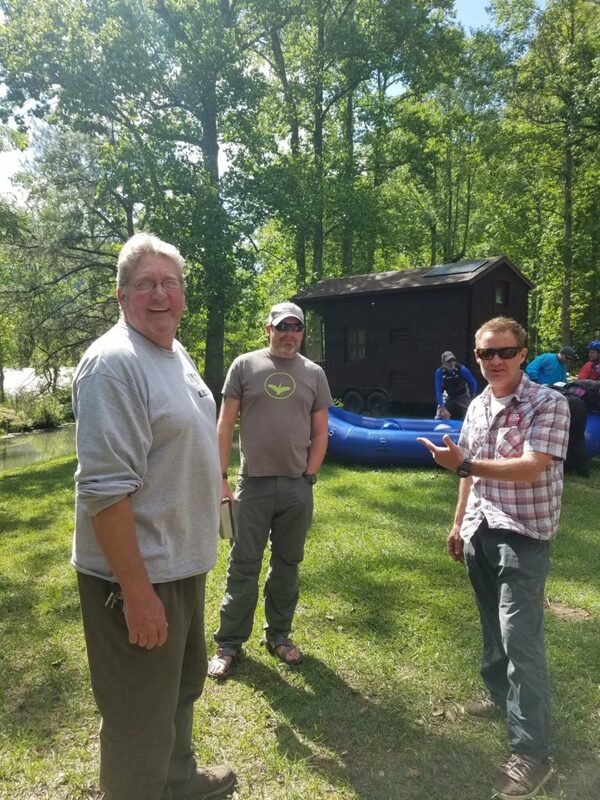 Upon arrival at Poplar we encountered several other rafts from Wahoo Rafting getting ready to put on. As we situated ourselves for launch I understood why the guides wanted the gorge, they were this year’s trainees! This was high water guide training! Personally I thought that was the coolest thing ever. Four people in a raft that are basically new and high water. This trip is going to be awesome! Am I nervous? OH YES! We started down through the gorge and the water was brown, surging, chocolate with marshmallow cream whitecaps. The waves were huge and fun. 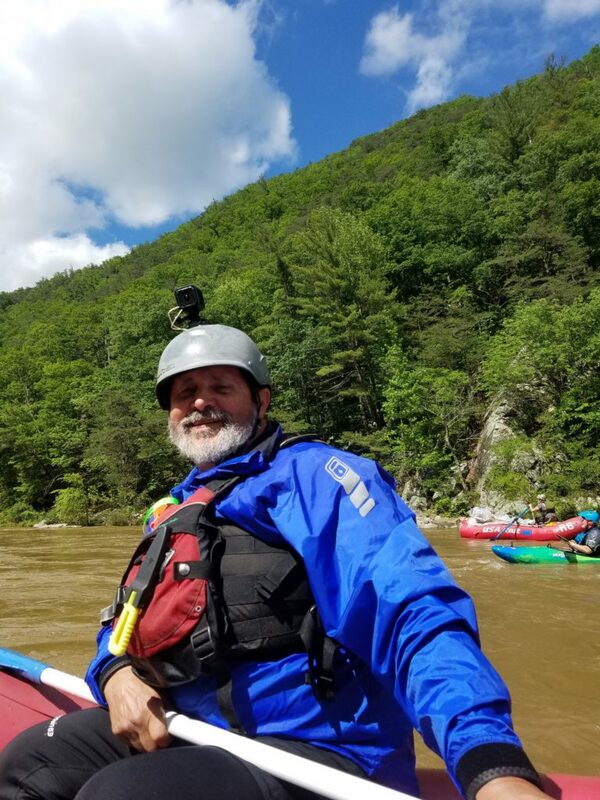 The Nolichucky opened into lines that I had never experienced before. Some features completely washed out, others just starting to peak.The Wahoo rafts in front of us were gone from the first rapid on. I kept watching the banks as we traveled through the rapids further and further. I wasn’t seeing any trash. I wondered if the guides could even get us to any trash if we did see it. I thought that this event was going to be a bust, just another fun day on the river. After several miles we came into the slower spots of the gorge. The Wahoo rafts were all gathered on the shore together and paddlers were walking the banks with bags of trash in their hands. Jerry informed me that Wahoo was training and picking up trash too. This day just got so much better! Without spoken rule from here on out of the gorge, every time we would stop on one side of the river, we would see blue rafts on the other side. The volunteers on the crews were having a blast. Some had never seen this section of river before, a treat for them. I watched as bag after bag filled and piled the rafts full, a treat for me. Wahoo came out with the Golden Paddle Award for best find. I watched as they went chest deep into the water yanking and tugging. I was curious to see what was under the water, wrapped around the huge boulder in front of them. After a lot of hard work I saw something big and orange start to poke out of the water. When they finished, they had brought up a complete coleman canoe. It had been reshaped somewhat by the water pressure and rock pin. Yep, it’s a goner! At the end of the day the cleanup was a very satisfying success, one that could not have been made without everyone working together. Matt Moses was a real hero on this day. None of this could have been made possible without his rafts. Special thanks to Wahoo for throwing in as well to help in such a special event. 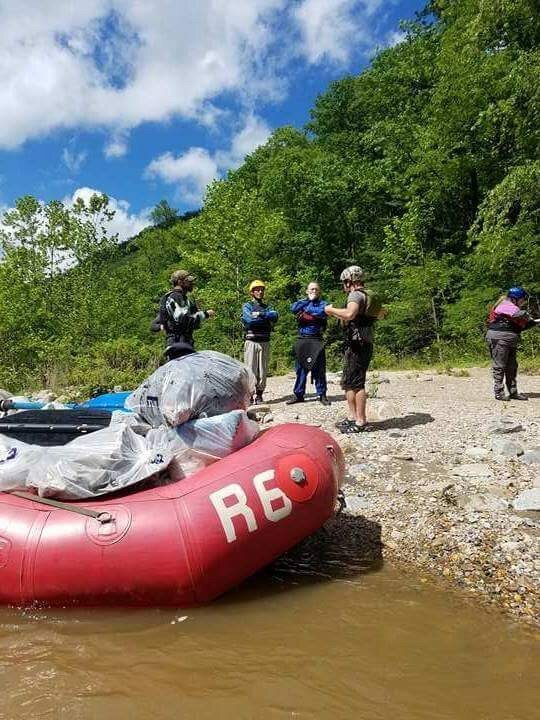 My debt of gratitude goes out to all the volunteers who participated, from Appalachian Paddling Enthusiasts to local paddlers who made this happen. It was a great day for all. Ben Carr had never paddled the gorge at this level. I could tell that he was a little nervous when we started, but he decided to cash in on his man card. He styled every rapid and boofed every rock. I was proud of him. 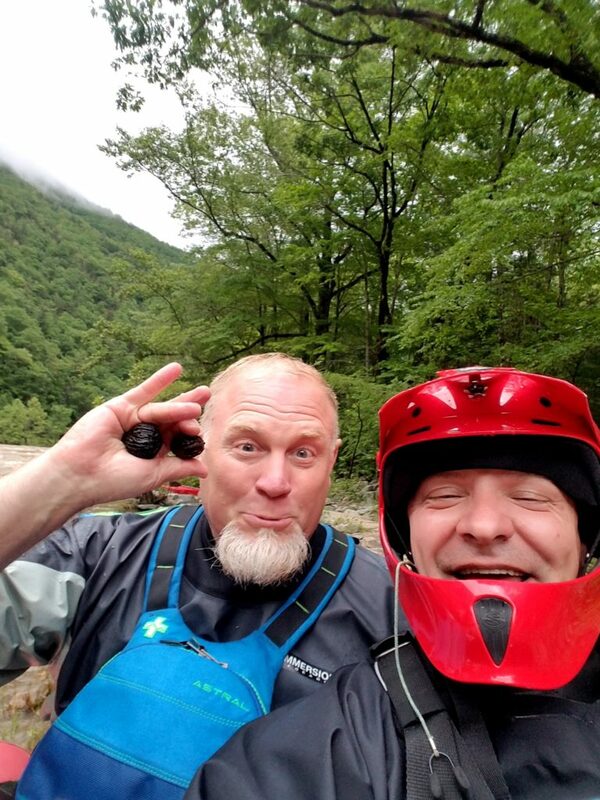 I got spend a whole day in a raft with a great friend (Jerry Griffin), and two awesome raft guides (Matt and Cody). Not one single raft was flipped on this great high water day. There was only one single swim. I would never mention the name Brad Wolff, but this guy really embraced the Wallace factor. Coming through Rooster Tail the raft simply left him. The raft went down and Brad just decided to hang out in the air for awhile before he dropped into the river. If he would have waved it would’ve been just like a Coyote and Roadrunner cartoon. Great times and great success! Thanks to all who came out. 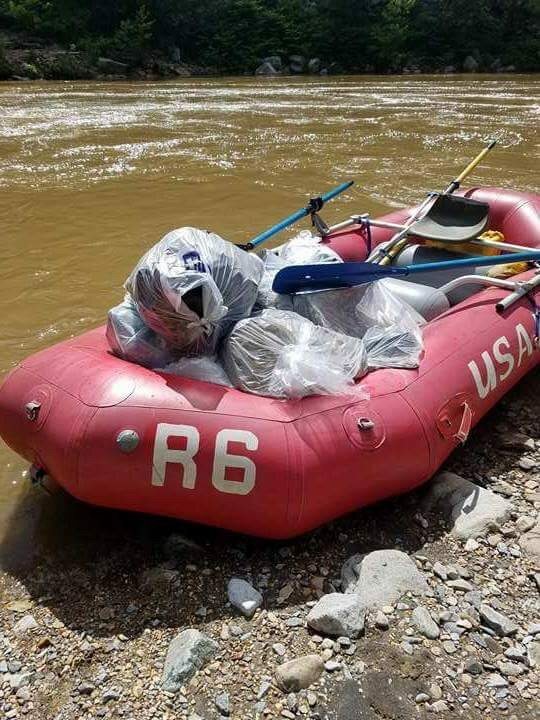 Remember to support USA Raft and Mountain River Guides, they are a great help to our community.